Washington’s Beth Wilt makes the return during a first doubles match against Unioto Wednesday, Sept. 5, 2018 on the courts at Gardner Park. 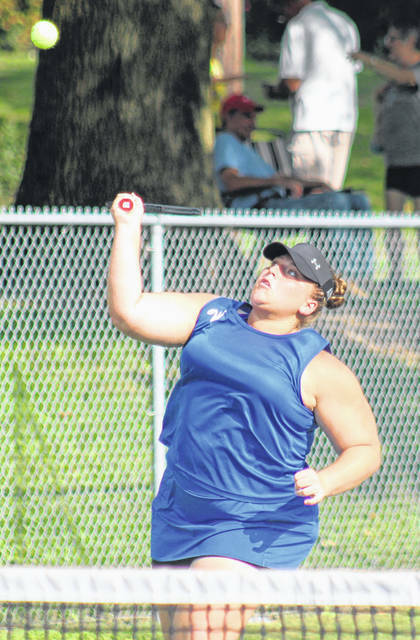 On another hot day in the first full week of September, the Washington Lady Blue Lion tennis team welcomed the team from Unioto High School for a non-conference match at Gardner Park Wednesday, Sept. 5. Washington won the match, four courts to one. State-qualifier Sylvia Gray beat Megan Downing at first singles, 6-0, 6-1. At second singles, Jen Richards defeated Nya Hamed, 6-0, 6-0. Brooklyn Foose shut out Autum Thomas at third singles, 6-0, 6-0. At first doubles, Sydnie Hall and Beth Wilt beat Candace Theis and Neysea Edwards, 6-1, 6-1. At second doubles, Brynne Frederick and Payton Maddux defeated Emily Hannah and Eden Greisheimer, 6-3, 6-0. “I am very proud of our team,” Washington head coach Samantha Leach said. “They are continuing to show improvement with each match. Megan competed against Gray, a previous state qualifier, and had several long rallies. It was a great match to watch. Washington travels to Miami Trace for a Frontier Athletic Conference match Monday, Sept. 10 at 4:30 p.m.